We really love to go to the park and play! My family has a once a week standing date for the park. When my son gets out of school we go to the park and play! Mr. Sweet Silly Sara meets us there when he is off of work. It is probably my kids favorite day of the week. 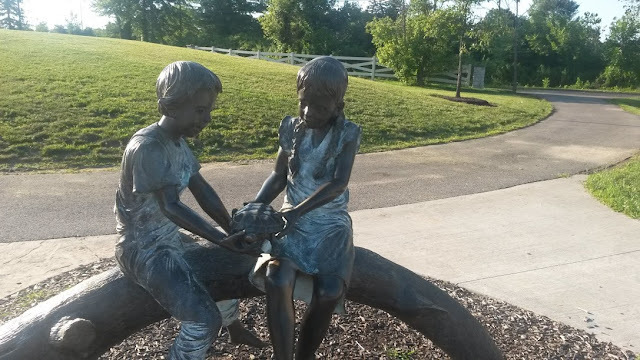 Not only do we love to enjoy the parks in our town, but we also love to get out and look for the best parks and playgrounds that Ohio has to offer. In August we had to make a trip to Lancaster, Ohio. That is a long drive with young kids. 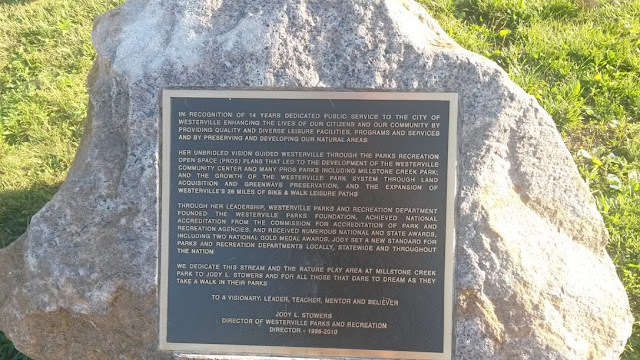 On our way back we made a detour to Westerville, Ohio to Millstone Creek Park. Our kids were so glad to get out, stretch their legs and play with other kids! This is the most awesome park we have experienced with the kids. As we arrived, we enjoyed a short walk over a boardwalk. My kids were delighted to hear a bullfrog and see it hop into the water. 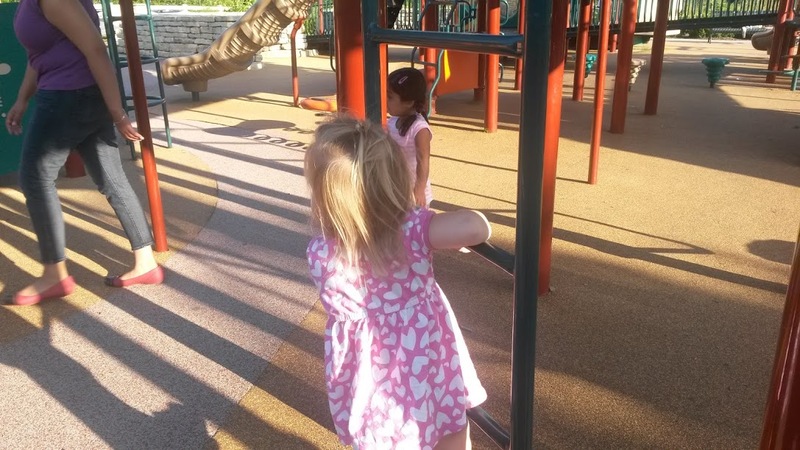 As we arrived at the playground my kids were ready to run! Harp loves Millstone Creek Park! My son really loved the park. He was a blur then entire time we were there. Constant motion! I promise he was there, but no great photos of Roo were taken. Harp was ready to climb! One of the things I loved about this park was there were so many things for kids of all ages and all abilities to do. This is one of the playgrounds that are accessible and fun for kids with special needs such as wheelchairs. Knowing that this area was designed with all kids in mind really sets it apart from others! The park had a nice sculpture to view and a great slide; that kind of went down a hill into an area of tall grass. This was fun for my adventure seeker son! 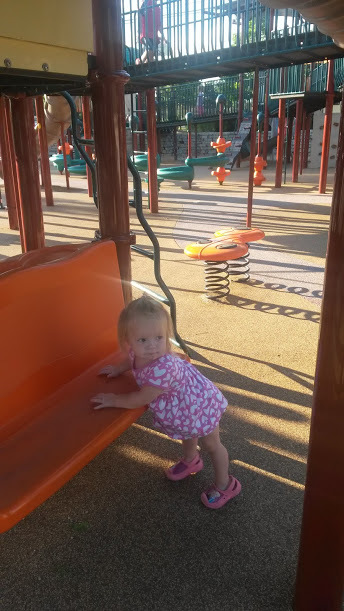 My sweet little Harper adored this park. There were so many things for her to do, explore and discover. To see her having so much fun was contagious. My mood immediately lifted upon the first sound of her giggles. This park was spacious, super clean and really quite lovely. The sound of happy children playing was thick in the air and there was no way to avoid the contagious feeling of a great summer day. The entire family loved the option of taking the boardwalk or hopping over some stones in a creek to reach the playground. 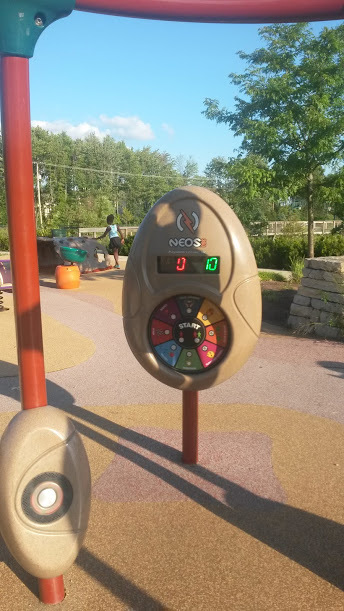 My husband and I had a blast playing this electronic game together. It was a fun way to get moving ourselves while showing our kids you are never to old to play! Millstone Creek Park was fantastic. It very well may be the best park in Ohio. 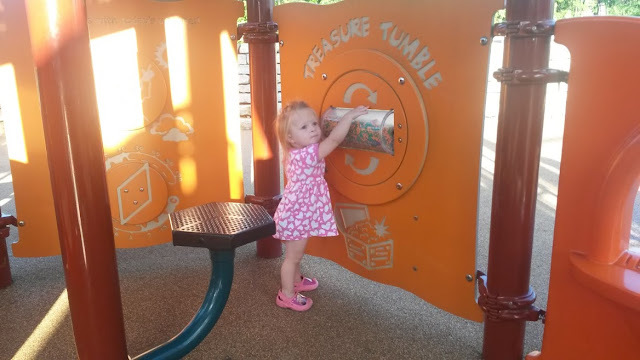 It is certainly on the top of our list of Best Ohio Playgrounds!